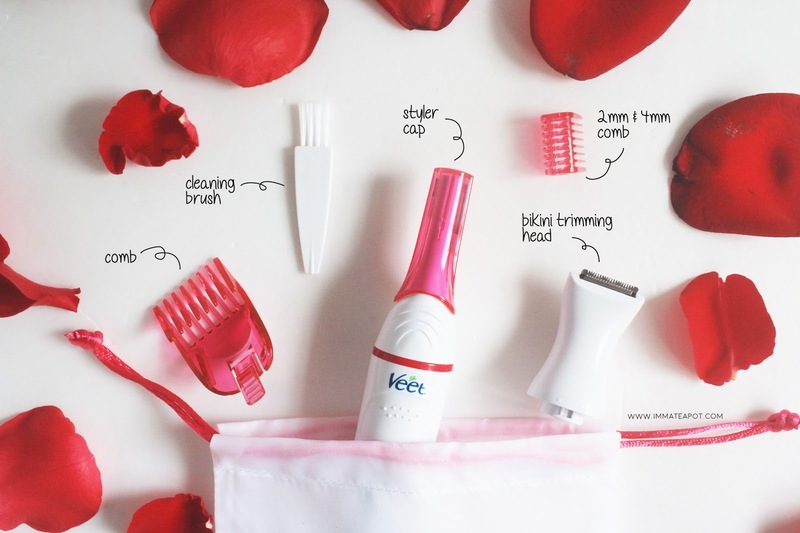 FYI, I am a supportive fans of Veet if you do read my previous post on how Veet has changed my life. I have been using Veet since Form 2 and now I am 24. Yeap, that's a few years haha! Recalled back what I have been through since young, being called hairy and I was really in-confidence in dressing up till I came across Veet. I am glad that Veet has transformed me and bringing back all the confidence in me. I am not ashamed on how I look now, dressing up in the way I am fond of, just the way I am, just the way I like. 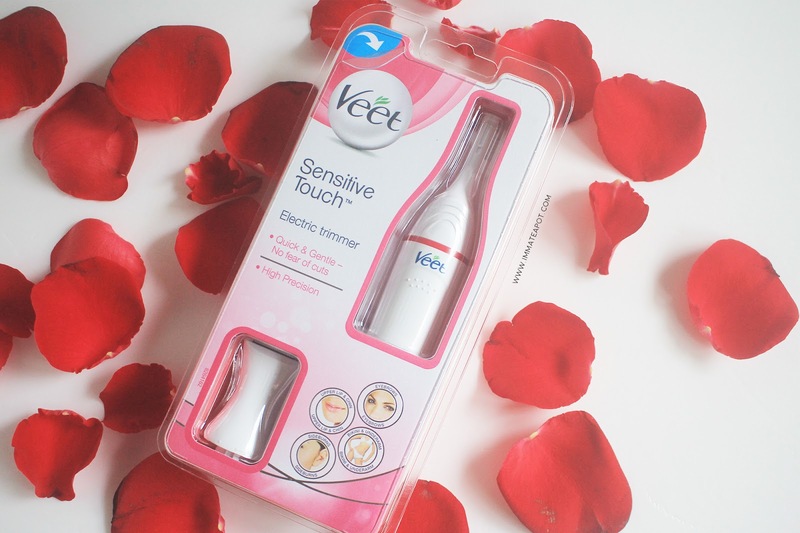 Finally, Veet has surprised me again by launching its very first innovative device, the Veet Sensitive Touch. Again! Coming out with the best solution that meeting all the women's demand and make hair trimming a breeze. Since my hormone is extra strong compare to an usual human being, I am forced to at least trim my brows once or twice a week. I usually trim my brows using the eyebrows razor, being gentle and extra cautiously of not getting a cut. But now, I don't have to worry anymore because Veet Sensitive Touch got me covered! I was so lucky to be gifted such amazing product which I really looking forward to try out since it was launched earlier. Here am I sharing my thoughts and experiences with you guys. 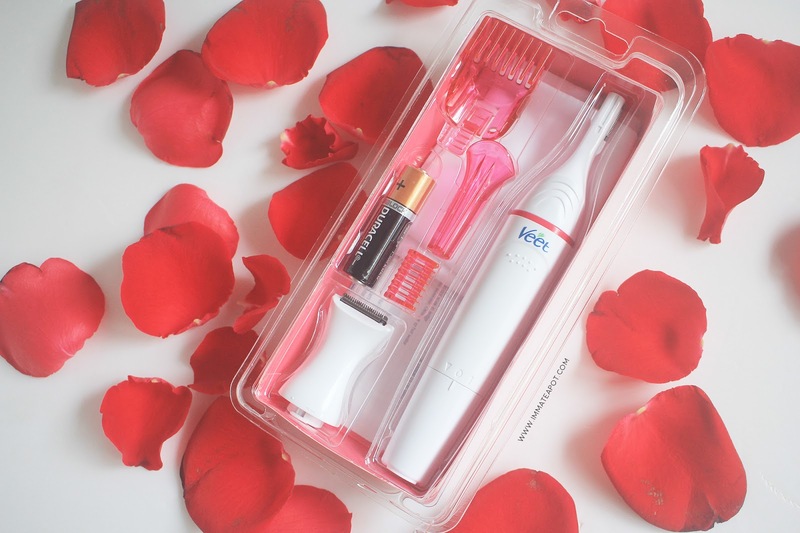 I really love how they package the styler, in full white with a touch of pink, which enhances the overall feminity of this product, well portraits its claim of sensitive soft touch. 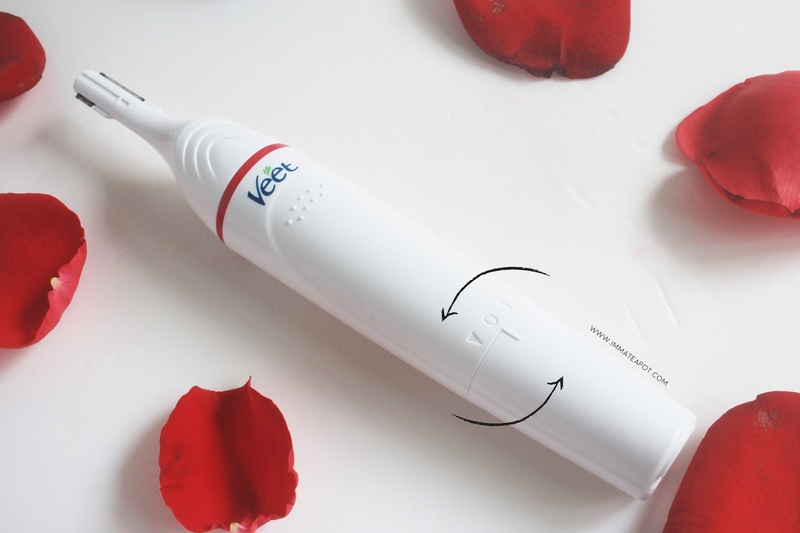 The size of the styler is about the size of a electronic toothbrush, convenient and handy with its cylinder tube shape. Unboxing the box, it contains a beauty styler, including a AA Batery, replaceable trimming head for brows (16mm & 6mm), replaceable bikini trimming head (20mm), a styler cap, two comb attachments, a cleaning brush and a beauty pouch. How thoughtful that they even come with a pouch! Just good enough to pack everything in it when ever we are planning out for travel. 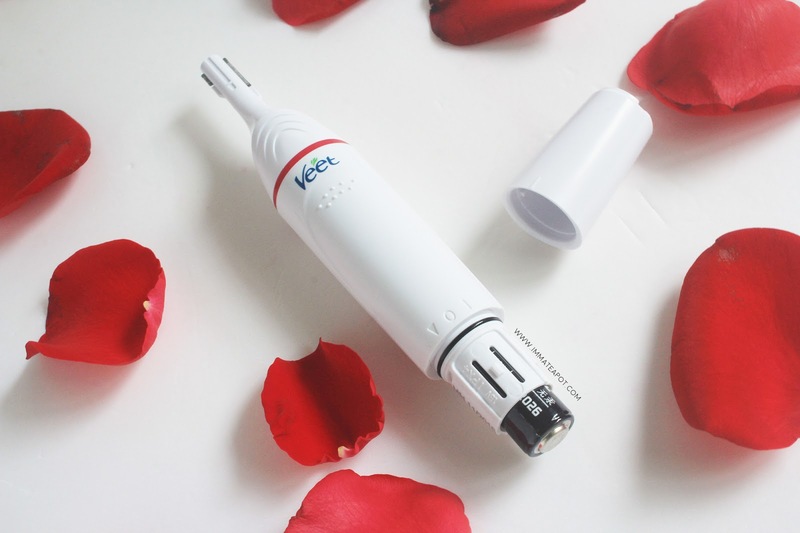 It's pretty easy to use where you just need to replace your preferred trim head and turn on the device by twisting it at the bottom of the handle. '▷' sign indicate to twist open the handle in order to fill or withdraw the battery. 'I' sign indicate turning on. 'O' sign indicate turning off. An AA battery is good enough to operate the device. - Always remember to use on dry skin. 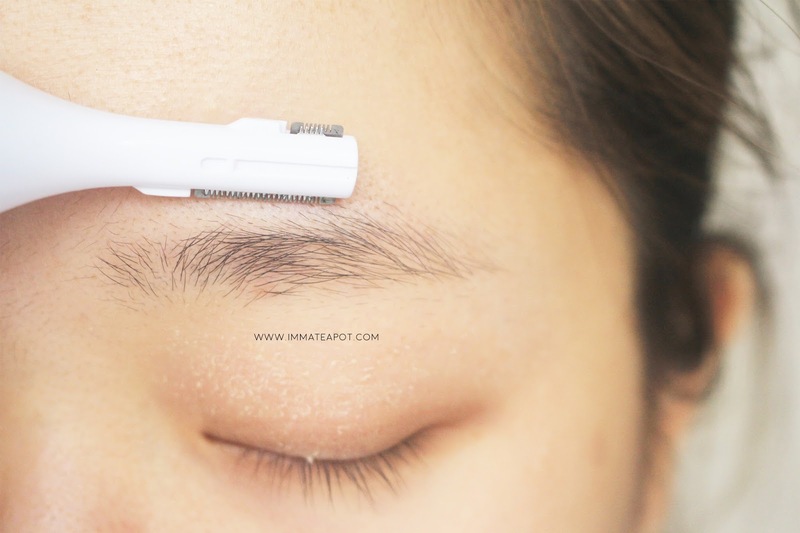 - For brows shaping and trimming, go for the 2 sided trimming head. It can easily reach out both of the larger (chin & side burns) and smaller areas (upper lips) precisely. - For bikini line shaping and trimming, go for the bikini trimming head. You may add on the comb for your desired length. - You may clean it using the cleaning brush by sweeping off the dust and remaining hair. - You may wash the trimmer head with tap water (not the device) and dry it with a clean cloth. - Adding 1 - 2 drops of lubricating oil to the blades help prolong its lifetime. I am under medication recently hence I hope it could really helps in treating such infection. Back to the review, it is rated at 4 out of 5. I hold on with one star as the device doesn't fully trim the hair from the end, as it will leave some tiny black spots. Other than that, I don't really like that the device's vibrate volume is rather high. I love this tool. Easy to use and can go back hometown use too. i think its scary to trim the eyebrows..imagine if you sneeze...gosh the horror! Wow! That is one precise trimming!